See the full Feedback contribution from Tommy Olsen, Project Manager, Tunnels at COWI, Denmark at the bottom of this article page and on the Feedback page. October 2018: Vital to the 55km long Hong Kong-Zhuhai-Macao fixed sea link highway is its 6.7km long immersed tube tunnel under the shipping channels of the Pearl River estuary and the two artificial islands that provide the transition from the landfall bridges into the undersea six lane carriageway. 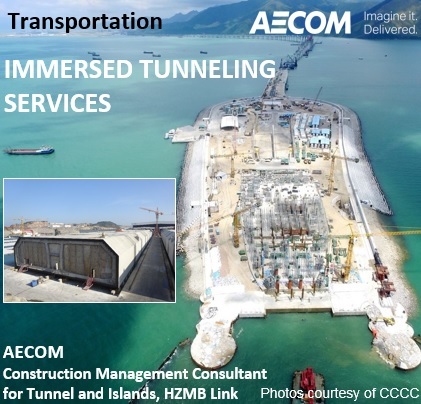 Several technological firsts contributed to the construction of the immersed tube and the two artificial islands, which together create the longest and deepest immersed tube tunnel in the world. The project - as an outstanding feat of engineering and the result of tremendous human effort - was opened officially on 23 October 2018 by President Xi Jinping of China. TunnelTalk, thanks for this excellent video showing project construction with many good details. The project was developed for Preliminary Design (for authority approval and procurement) by a JV of HPDI of CCCC (commercial lead), STEDI and COWI (technical lead) in 2008-2009 and constructed under a design-build contract by a JV of CCCC, HPDI of CCCC, FHDI of CCCC, AECOM, STEDI and COWI from 2010 to 2018. The owner HZMB, had support from TEC. The distance of the immersed tube, portal to portal, is 5.6km and longer if the length of the two artificial islands is included for the distance from bridge to bridge connection. The Hong Kong-Zhuhai-Macao undersea link is the world’s longest road immersed tunnel; the Busan-Geoje link in Korea is its deepest road immersed tunnel; the Bosporous rail link in Istanbul, Turkey is the deepest immersed tunnel; and the San Francisco Bay crossing for the BART metro system is the world’s longest immersed tunnel.